Well it’s all about me… and yeah, I’m a bit obsessive as well. I am very interested in art and Pam Easton and Lydia Pearson are definitely in that category – and that expression is evidenced in their fashion label Easton Pearson, particularly in their special one-off pieces. 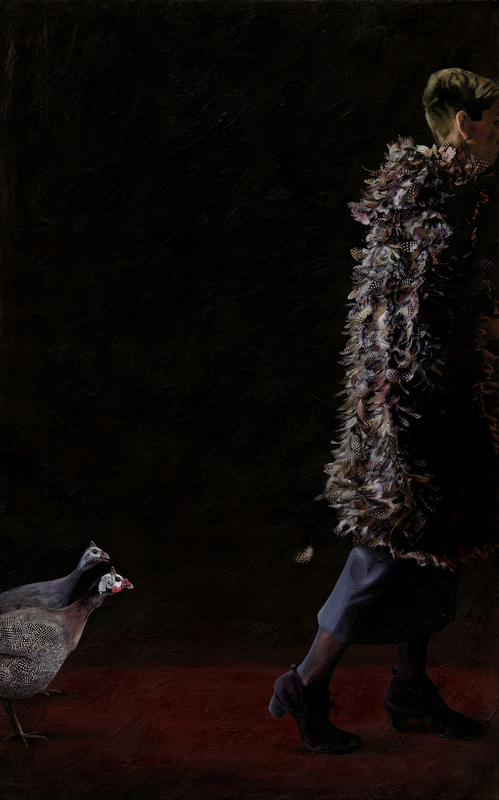 I put on this coat of guinea fowl feathers and I am transported somehow, I feel better about the world. It costs a lot of money. I agonize for two weeks and run through the reasons for and against. Then I wake up at 2.00 am. I have to do a portrait, a self portrait – and I need the coat! It all makes sense. The family say it is an E.P. addiction – and I am NOT interested in rehab. I’m done with painting feathers though. Hi Jane, malE here in Tunbridge, Tasmania . . . I LOve this dark and moody E.P. draped side view portrait, well done! I don’t know how but I missed New Farm Squared when you posted it but have caught it now, excellent . . . keep up the new work!